Humans have made rugs out of every possible material for millennia. Ancient tribes wove together reeds and grasses to make primitive rugs and keep the cold ground warm. Over 5,000 years ago, nomadic tribes hand-wove rugs out of camel, sheep, and goat hair. Archeologists have uncovered evidence of rugs in Egyptian and Mesopotamian tombs dating back more than 4,000 years. The oldest known surviving rug is the Pazyryk Carpet, which dates back to 500 BC. It was discovered in Siberia in 1949. Despite its age, the carpet was evidence of an extremely advanced and intricate technique with rich colour fibres. If only they had professional carpet cleaners back then to keep the Pazyryk Carpet looking sharp. While originally rugs were quite practical and meant to keep floors warm, as animal domestication continued and civilizations began to form, fancier rugs became a sign of prestige and class. Persians perfected this art by weaving precious metals like gold and silver into wool rugs. The Spring Carpet of Chosroes, for example, was an ornate rug that depicted a scene of springtime. It weighed several tons and was more than 400 feet long. The rug was shredded by Arab armies to try to capture some of the stones within. 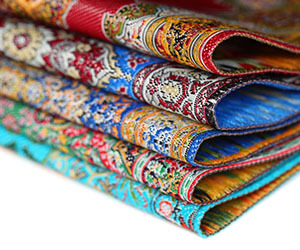 Many different cultures in Asia from Afghanistan to Turkey to India developed their own rug styles, with different techniques and materials. The art of weaving was brought to Europe by traders from Persia and the Middle East to Spain around 1000 CE. The phenomenon slowly but surely spread across the European continent. Spaniards were praised for their intricate hand-woven rugs, which were purchased by royalty across the continent as a display of wealth and prestige. In fact, before hand-woven rugs became common, even the most elegant palaces in England had hay flooring well into the 16th century. European royalty continued to order custom rugs from talented weavers in the Middle East. Rugs are mostly woven through a mechanized process these days, making them much more affordable for regular people to have in their homes. Still, hand-woven carpets are praised for their artistic value and are still sold in large quantities today. Professional carpet cleaners help keep rugs in tip-top shape. They are woven with many different piles and natural or synthetic fibres ranging from nylon and wool to polyester and acrylic. No matter what kind of rug you have, keep it clean and well-maintained with the help of professional carpet cleaners.